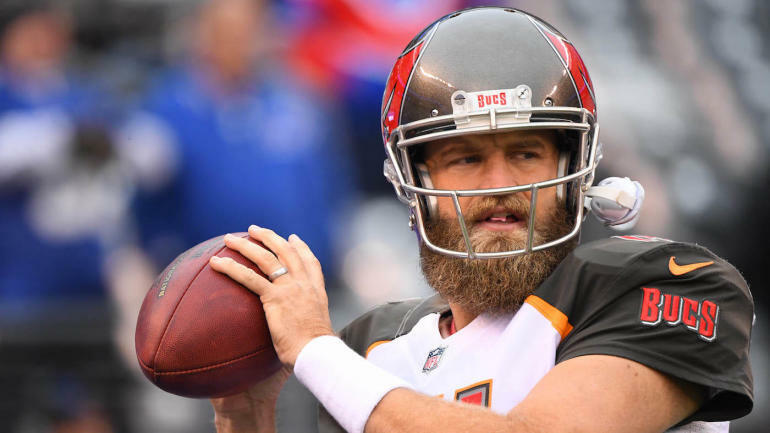 It turns out, there’s an explanation for that unflattering photo of Ryan Fitzpatrick that recently emerged from a Dolphins offseason workout. But that explanation isn’t at all related to Photoshop or an unfortunate camera angle. Instead, it’s entirely related to birthday cake. On Tuesday, the Harvard graduate, NFL journeyman, and new Dolphins starting quarterback explained why he doesn’t appear to be in the best shape of his life. In his words, he’s in “peak offseason form” because he’s been going to so many birthday parties and therefore, eating so much birthday cake. All jokes aside, Fitzpatrick, who signed a two-year deal this offseason to be the Dolphins’ starting quarterback unless they acquire a better option before or during the draft, still has plenty of time to get into football shape. Fitzpatrick has been in the NFL since 2005. By now, he knows what kind of shape he needs to be in by the time the season arrives. And it’s not like he plays a position that requires him to be in the best shape of his life. In the words of former Dolphins quarterback Jay Cutler, “The good thing is I play quarterback, so I don’t have to be in that great of cardiovascular shape.” Then again, give how poorly Cutler’s lone season in Miami went, Fitzpatrick might not want to take his advice. The bigger concern for the Dolphins is that Fitzpatrick, regardless of what kind of shape he’s in, isn’t a very good starting quarterback. Throughout his career, he’s managed to hit a few incredible highs that have been all too often negated by stunning lows — with the 2018 season serving as the perfect example. In eight games with the Buccaneers, he averaged 9.6 yards per attempt and threw a touchdown on 6.9 percent of his passes, but he also threw an interception on 4.9 percent of his passes. Fitzpatrick’s career passer rating rests just above 81. The Dolphins settled on Fitzpatrick as their starter only after they failed to sign Teddy Bridgewater, and Fitzpatrick will be their starter only until they can acquire their long-term franchise quarterback, which could happen as soon as this year’s draft. He’s a bridge — right now to nowhere, but eventually, to a younger option. In all honesty, the best-case outcome for the Dolphins would be having Fitzpatrick struggle in 2019 to set them up with a high pick in next year’s draft, which they could then use on one of the top quarterbacks.